Every Woman Counts Luncheon by Healthy Birth Day, Inc.
Tue, Apr 23rd 2019 at 11:30 AM CDT · By Healthy Birth Day, Inc. The Every Woman Counts Luncheon is our largest fundraising event of the year hosted in the Iowa Events Center Grand Ballroom in downtown Des Moines. Healthy Birth Day, Inc. will celebrate ten years as a 501(c)(3) nonprofit organization and five years of the Every Woman Counts luncheon — so look for special surprises! 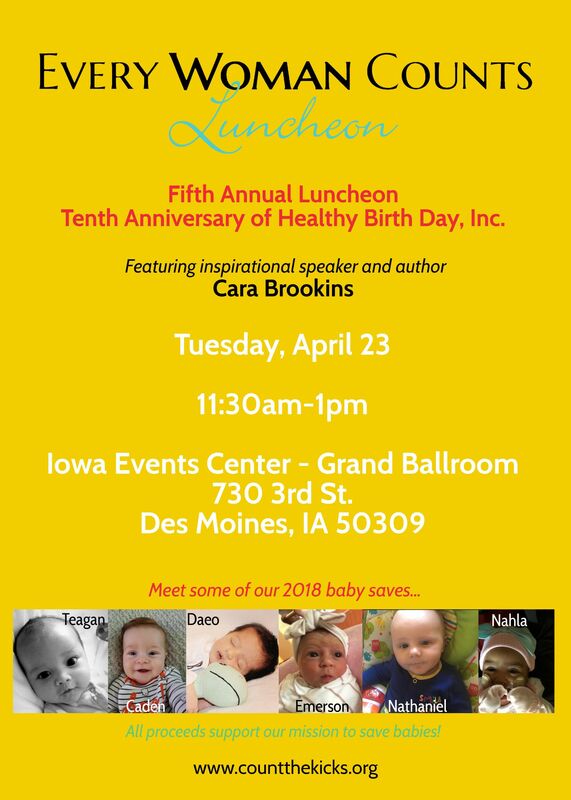 Proceeds from the luncheon will benefit the Count the Kicks awareness campaign and educate and inspire more expectant moms to track their baby’s movements in the third trimester. Cara is best known for being the mom who built her own house using YouTube tutorials. She’s also a professional speaker and the author of eight books, including Rise, How a House Built a Family, which tells the story of building her 3,500 square foot house with the help of our four children. Healthy Birth Day, Inc. has partnered with Give Lively to securely process your online donation. This transaction will appear on your credit card statement as "Healthy Birth Day, Inc.". This transaction is subject to Give Lively's Terms and Privacy.